Well, there can’t be any doubt about it now. President Trump’s trade policy course changes – and especially his determination hike U.S. tariffs – are already harming American manufacturers and the broader economy. After all, this Bloomberg News post just told us so. Except if you examine it carefully, and add a little common sense info, there’s no reason to believe any of these claims – especially for the manufacturing sector. As the chart shows, the prices paid by inputs for factories in the Northeast sank significantly between 2014 and 2015. Steel prices fell especially sharply (largely because the Chinese government was fueling a massive global glut in this metal). And according to official U.S. data, how did American domestic manufacturing fare? It grew in real value-added terms ( a measure of output preferred by many economists) by all of 0.90 percent. The following year, according to the chart, prices these factories reported paying stayed very low, but began rising. Steel prices rebounded significantly, too. Manufacturing’s real value-added growth that year? About half the 2014-15 rate – 0.47 percent. Those factory prices rose even faster the following year, and steel prices kept increasing. But the impact on America’s domestic manufacturing wasn’t exactly catastrophic. In fact, its annual real value-added growth nearly quadrupled – to 1.89 percent. How on earth could this be? How about this as a starting point for an answer? Prices of steel or any other inputs aren’t the only influences on business performance. And they’re probably not the most important. For example, demand (aka “customers”) matter, too. In the United States, when those metals prices were dropping sharply between 2014 and 2015, price-adjusted economic growth turned in a solid 2.90 percent growth. The following year, when metals prices stayed unusually low, the real economic growth rate halved. And guess what also nearly halved? Manufacturing’s real value-added increase. Even more interesting – between 2016 and 2017, when metals prices kept bouncing back, manufacturing’s real value-added jumped. Maybe in part because the economy’s overall growth rate increased by more than 50 percent, to 2.30 percent? Looking at global growth (i.e., including foreign customers) yields similar conclusions. During that 2014-15 year of greatly reduced metals prices, pretty good U.S. growth but lousy manufacturing growth, the International Monetary Fund tells us that the global economy expanded by (a pretty poor) 3.10 percent. Chances are that feeble growth didn’t help America’s manufacturers, many of whom make much of their money by exporting. Global growth only picked up to 3.20 percent the following year, but America’s growth tanked. The latter, then, seems to have mattered more to domestic manufacturers, as their own expansion rate fell by 50 percent. Between 2016 and 2017, however, when both the U.S. expansion and the global expansion sped up (the latter to 3.80 percent), American manufacturing’s growth experienced that impressive takeoff. 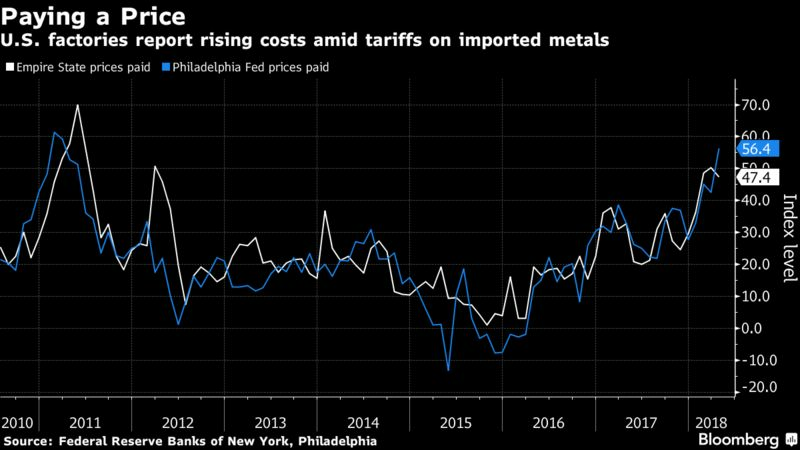 Now it’s true that the Trump metals tariffs could inflict greater harm on U.S. domestic manufacturers going forward, as they could impose on metals-users new costs that come on top of whatever global prices they need to pay at a given moment. Nonetheless, it’s not like industry is exactly helpless to respond. For instance, it could start improving its productivity performance – which has been lousy on balance during this economic recovery. More productive sectors and companies of course can pass on input price increases without charging their customers more – and thereby undercutting their competitiveness. At the same time, the metal-users’ loud complaints about the Trump tariffs point to a longstanding weakness of U.S. trade policy and especially the related body of trade law that the President has needed to rely on so far because the chief executive’s unilateral tariff-imposing authority is so limited. Because the trade law system, like U.S.-style legal systems generally, springs into action only when a specific complaint from private business is filed, its remedies are confined to that industry’s predicament. Not even the few trade cases initiated by the Obama administration or even the Trump administration have changed this pattern. (The sweeping tariffs on China sought in the President’s Section 301 intellectual property-centered action have come closest.) The tendency of such narrow-bore measures to enable foreign trade rivals to respond with divide-and-conquer tactics shows that two improvements should be made. First, as proposed by my previous organization, the U.S. Business and Industry Council, industry-specific tariffs approved by the trade law system should be accompanied by similar protection for the “downstream” (i.e., user) industries. As a result, they would be much less likely to be victimized in the American market, anyway, by foreign competitors not saddled with higher input prices. Second, and even better, the administration should revive the Border Adjustment Tax that was part of the tax reform plan initially introduced by the House of Representatives’ Republican leaders. This measure, which would have worked much like the foreign Value-Added Taxes (VATs) used by most trading economies, would not only have provided the equivalent of protective tariffs for all U.S. goods and services facing import competition. It would have boosted the competitiveness of all American exports in all foreign markets by providing the equivalent of a subsidy. Although President Trump initially (and weirdly) was cool to the Border Adjustment Tax, reportedly more recently he’s been changing his tune. Adopting this plan in particular could solve most of the economic as well as the political problems currently threatening his trade policies. (What’s Left of) Our Economy: A Trade Cover-Up at Bloomberg? Or Just Ignorance? Memo to Bloomberg News and its Editor-in-Chief Emeritus Matthew Winkler: If you’re going to try to foist a flagrant piece of trade fakeonomics on your readers, choose a contention that can’t be debunked after twenty minutes searching on Google. According to an August 18 article by Winkler, Idaho is America’s “top performing” state economy and “relies heavily on international trade for its success.” Moreover – irony alert! Even though its “21st century economy…shows that the U.S. does best when it puts the world first,” the state’s (inexplicably) doofy voters went for that quintessential America-Firster, Donald Trump, in the last year’s presidential election – and by a two-to-one margin! He seems unaware, however, of all the data showing that Idaho’s trade performance has been anything but impressive. For example, let’s look at the state’s goods export performance, and over an analytically respectable period of time. This information is easily found on the Census Bureau’s website. These data show that, from 2013 to 2016, measured in current dollars, Idaho’s goods sales overseas actually shrank as a share of the U.S. total: from 0.4 percent to 0.3 percent. Moreover, its exports as a share of its the state economy fell faster than the corresponding figure for the entire country – by 23.76 percent versus 17.09 percent. Idaho has indeed grown faster than the nation as a whole during this period – by 6.57 percent in toto in constant dollars (the same value unit used for the above trade figures) versus 6.48 percent. But it clearly hasn’t grown much faster. And exports have hardly been at the leading edge. It’s true, moreover, that Idaho has run a merchandise trade surplus during this period. Indeed, it’s risen from $244 million to $383 million. (We’re back to pre-inflation dollars here, because the Census state trade date don’t adjust for price changes.) But that’s mainly because its imports have tanked. Does Winkler view that as a positive? If so, he wouldn’t be much of an enthusiast for trade’s contribution to the U.S. economy overall – since in those years it ran a goods deficit that grew from $738.8 billion to $778.2 billion. Similarly, Idaho has performed relatively well in terms of those measures that shed light on how well its economy has been performing for its inhabitants. For example, its wages have been growing faster, in current dollar terms, than their national counterparts, both measured by the average and by the median. The former in Idaho is up during those years by 7.43 percent, versus 5.57 percent for the United States as a whole. The latter is up 7.93 percent between 2013 and 2016 versus 6.85 percent for all American workers. (See this Bureau of Labor Statistics site for national- and state-level information for 2016 and this source for the 2013 numbers.) At the same time, how can trade and especially exports be credited if the latter have fared so poorly? Again, these data are no secret. But Winkler either was completely unaware of them and had no interest in thorough research, or he was hoping you wouldn’t find out. The debate over whether American wages are rising or not continues apace. Hopefully, if only for the sake of competitiveness, the optimists will come up with offerings better than Conor Sen’s column on Bloomberg today. He claims that breaking workers down by age group shows clearly that the only cohort of the workforce suffering anything close to wage stagnation is the huge generation of Baby Boomers. You can easily see this trend by just eye-balling the chart. Although wage increases have experienced ups and downs for all age cohorts, each successive peak since 1998 has been lower than the last. Nor are your eyes deceiving you. The interactive feature of the chart (which can be used in on the original on the Atlanta Fed website linked above) makes clear that, measured by twelve-month moving averages, median wage growth for the workforce as a whole peaked (before inflation) in the spring and summer of 2001 at about 5.2 percent. For workers aged 16-24, though, wages then were surging by roughly 9.5 percent (slightly less than in the late-1990s), for those in the 25-54-year old group, the figure was between five and 5.2 percent, and for that year’s workers older than 55, only about 3.7 or 3.8 percent. The next high for the overall workforce came in the fall of 2007 – just before the Great Recession hit. Overall wages were still rising in pre-inflation terms, but only at 4.2 percent. That was also the rate of increase recorded in wages for the 25-54 cohort, while wages for older workers were improving by only about 3.2 or 3.3 percent a year. The best performance was put in by the young, whose wages were increasing by 9.3 percent. So these peak figures were lower for all groups of workers than the previous one. The next wage peak has come this spring. But overall wages have only been rising at a 3.5 percent annual rate. The 25-54-year old age group has done a bit better – 3.8 percent. But that’s lower than their last peak increases (4.2 percent). The boomers’ rate of increase is a thoroughly unimpressive 2.2 percent – also lower than this cohort’s progress just before the recession struck. Although younger workers are indeed doing much better than that – their paychecks have been growing by 7.5 percent – but that pace is much slower than the 9.3 percent increases registered a decade ago. Moreover, just last November, the wages for the 16-24s were improving at an 8.4 percent annual rate. So for the time being, they’re already past peak. In other words, although younger workers have consistently out-earned older workers for the last nearly two decades, their rates of increase keep trending lower and lower. And guess what? Everything we know about biology tells us they’re going to get older – and therefore presumably move into the age groups whose wages haven’t risen nearly as fast. Here, though, is what I am pretty confident about. 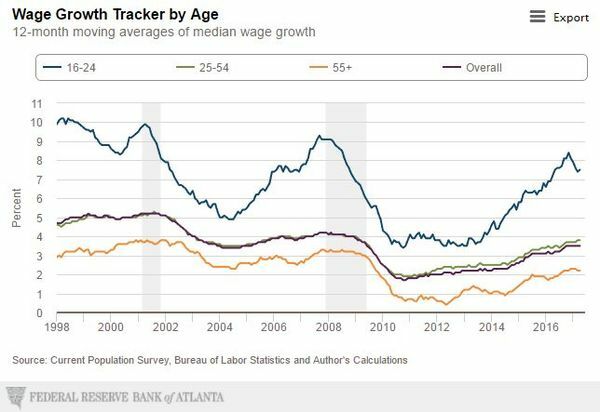 Few Americans are going to look at the Atlanta Fed chart showing steadily lower highs for young workers’ wage increases and conclude that Happy Days Are Already Here Again on the paycheck front. It’s obviously just a coincidence, but it was a heartening development anyway. Soon after I made an unconventional (but urgently needed!) observation about the relationship between trade policy and domestic anti-trust policy, two items came out in the news showing that some big shots in the economics and business world – including a key adviser to Donald Trump – have been thinking about the same subjects. My point, made briefly in my recent op-ed for CNBC.com, noted that backers of current trade policies seemed much more concerned with maximizing economic competition and its benefits by opening the U.S. market to more foreign entrants than by countering the rise of monopolies and oligopolies at home. For centuries, of course, economic thinkers have been telling us that the more producers of goods and services enter a market, the more fiercely they need to vie with each other for sales, and the more pressure they feel to innovate, to raise quality, and to lower prices. Therefore, creating the greatest possible levels of competition has long been a main objective and rationale for seeking the freest possible international trade flows. But last spring, as I wrote, the White House Council of Economic Advisers came out with a study reporting that American levels of business concentration in many sectors of the economy have become worrisomely high. In other words, too many monopolies and oligopolies have emerged lately, slashing the number of businesses competing for customers and threatening to boost prices and depress quality and innovation more than would otherwise be the case. The result, I argued, was a downright weird, and logically indefensible situation: Washington has been working overtime, in recent decades in particular, to promote competition by bringing more foreign entrants into the U.S. economy. But it’s also largely turned a blind eye to (and arguably at times encouraged) business deals inside that same U.S. economy that lowered the numbers of domestic participants and therefore weakened competition. Given all the other problems I’ve linked to current trade policies, I suggested that these priorities have been completely backward. More competition is definitely a benefit. But why such apparent doubt by supporters of these trade policies that the gargantuan American economy can create adequate levels all by itself if government pursues vigorous anti-trust policies? Why such apparent determination to ignore how focusing on maximizing domestic competition ensures that the main corporate benefits – more competitive companies and all the jobs and production they’d be able to generate – remain in the United States? And why the great reluctance to acknowledge that much of the foreign competition admitted into the U.S. economy is either owned, controlled, or heavily subsidized (or some combination of the three) by foreign governments? Their successes clearly distort economic activity in the United States and abroad, and longer term, undermine free markets and the gains they can produce everywhere. That’s why I was so interested to read this week of new academic findings that American companies that have faced greater Chinese competition lately have cut all kinds of new investment – including on research and development. In other words, they’ve became less innovative. As explained by Bloomberg columnist Noah Smith, economists have never ruled out the chance that greater foreign competition could undermine corporate innovation – e.g., because firms suffering consequently lower profits would have fewer resources available to pay for laboratories and tech workers. But scholars much more often assumed that greater trade competition would produce the opposite results. Of course, the new research could mean that fostering greater domestic competition could produce the same innovation-curbing results. But perhaps it’s also reasonable to suppose that removing or reducing the foreign competitive pressures and increasing the domestic pressures could strike the best possible combination of benefits. I’ll be watching this front closely for answers to these crucial questions. To complicate matters further, Thiel describes himself as a libertarian. It would be tempting to conclude from these items that no one with any standing in economics and business knows anything definitive or even useful about the relationship between trade and competition anymore. But let’s not forget the potential bright side. For decades, trade theory has been one of the most stagnant, encrusted area of economics (and the punditry and chattering class conventional wisdom it’s spawned). Clashing findings could signal that obsolete sacred cows are finally starting to be challenged. For me, few developments could be more hopeful. As RealityChek regulars know, my biggest fear about the U.S. and global economies concerns the likelihood that rebounding, trade-centered current account imbalances around the world will lead to an international financial and economic crisis just as they did in the previous decade. The big difference next time, of course, would be that major central banks would not have already poured trillions of dollars and yen and euros worth into major economies in a vain attempt to promote historically adequate growth. So it’s great to see these concerns coming from a new source. As reported by Bloomberg last week, on top of the International Monetary Fund, the U.S. Treasury, and, as I’ve reported, leading academic economists) a leading analyst from the HSBC bank is expressing comparable worries. To review quickly, the idea is that the record trade and broader payments shortfalls run by the United States in the “aughts” sent so much foreign capital flooding into the country that most incentives to use these funds prudently vanished. And with years of deregulation and lax regulation freeing American finance companies to concoct ever more reckless schemes to deliver acceptable returns in the face of this yield-depressing glut, much of the economy turned into a gigantic, housing- and consumption-fueled Ponzi Scheme. I’d add three extra points. First, the offshored U.S. manufacturing production behind so much of the nation’s trade deficits greatly reduced the number of genuinely productive investments that the American financial sector could contemplate. Meanwhile, the burgeoning narrative that manufacturing was increasingly passe for an advanced economy like the United States kneecapped any expectations that adequate productive investment opportunities would return any time soon. Second, the neglect of productive domestic sectors like manufacturing played a major role in plunging the United States into the secular stagnation trap so cogently described by former Treasury Secretary and Harvard economist Larry Summers. For an economy lacking adequate productive ways to foster growth – and especially a democracy – will be continually and sorely tempted to spur short-term growth by inflating dangerous credit bubbles. Third, America’s proposed new trade deals, especially the Trans-Pacific Partnership (TPP) are likeliest to boost U.S. trade deficits further. Their most economically dynamic signatories depend heavily on net exporting for growth. Their foreign market-opening measures are either inherently difficult to enforce or subject to dispute-resolution processes stacked in favor of export-dependent defendants. And America’s remaining trade barriers are easy to identify and will be much easier for the other signatories to eviscerate. Indeed, TPP is modeled on the bilateral U.S. trade agreement with Korea, under which the American merchandise deficit has skyrocketed. The analysis by HSBC’s Janet Henry doesn’t apparently go into this degree of trade policy detail. But it makes two especially disturbing points of its own. First, as made clear by this chart, the global imbalances in toto are back to their bubble-decade levels – and then some. True, the American shortfall is down since peak bubble bloat. But it’s up since the current economic recovery began. Moreover, the historic sluggishness of the current expansion is undoubtedly keeping the current account and trade gaps down. Second, the chart shows that the biggest source of resurgent current account surpluses is “Other Asia” – which of course includes Japan and other important TPP members. China’s chronic surplus hasn’t recovered quite as fast, but TPP could change that as well, since its inadequate rules of origin give outside countries a wide open backdoor into the new trade zone. As strongly suggested by his renewed TPP push, President Obama either doesn’t know about these developments and relationships, or doesn’t care. If he succeeds in a lame duck session of Congress, or if his successor fails to heed the glaringly obvious trade policy lessons, Americans may look back on their current secular stagnation as an economic golden age. Especially given some genuinely clownish performances over the last 24 hours, it’s a great pleasure – and relief – to report that not all journalists think it’s newsworthy what Donald Trump thinks of the Cincinnati Zoo gorilla shooting, or what physics giant Stephen Hawking thinks of the presumptive Republican presidential nominee. For instance, there’s Bloomberg news’ Andrea Wong, who’s just written a terrific story about decades of American financial relations with Saudi Arabia that vividly portrays the risks the country runs when it develops heavy dependencies on imports of crucial products – in this case, oil. It nicely reinforces the message of Saturday’s post about the blind spot Americans too often display when it comes to safeguarding their economic independence. At the same time, a careful reading of the Bloomberg piece strongly indicates that much of the vulnerability and weakness U.S. officials perceived during that 1970s period when the crucial bilateral decisions were made were just that – perceptions. Even worse, they were arguably perceptions that were seriously off base, and the underlying potential problems were entirely avoidable. Wong might have added that American politics and government was in turmoil as well. In July, 1974, when a Treasury Department team was sent on a crucial mission to Saudi Arabia (as part of a larger Middle East and Europe trip), Richard M. Nixon’s impeachment and removal from the presidency was barely a month away. Yet the delegation, headed by Secretary William E. Simon, succeeded. The Saudis resumed supplying the United States with oil and plowed most of their proceeds back into U.S. Treasury debt, which enabled America to keep living beyond its means. (I know – this is a dubious benefit at best.) In return, the United States greatly stepped up sales of arms and military equipment to the Saudis, agreed to keep the scale of their Treasury holdings secret, and even gave the kingdom special access to the Treasury market. Moreover, Washington agreed (until this month) to the key condition that the Saudi Treasury holdings not be made public when the Department issued its monthly reports on foreign owners of U.S. government debt. The arms sales angle also worked in Simon’s favor – in two ways. First, American weapons generally speaking were the world’s best. Second, the Saudis didn’t have a serious option of turning to the former Soviet Union, the closest competitor to the United States in military technology. Dealing with the atheistic Soviets could have stabilized the fundamentalist Saudi theocracy as much as disclosure that its financial support for the U.S. economy was in theory indirectly helping America pay for its own arms sales to Israel – the fear behind the Saudis’ insistence on keeping their Treasury purchases secret. In addition, as poorly as the U.S. economy was performing in the mid-1970s, in part because it still supplied much of its own demand for oil, it was in far better shape than the Europeans and Japanese. They were far more dependent on Middle East producers, and therefore were paying much higher relative oil import bills. The real lesson here: The United States all along possessed the potential to prevent the Saudis and other foreign oil producers from even appearing to gain a stranglehold over the American economy. Its real and perceived vulnerability stemmed from neglectful policies, not geological realities. Fast forward to today, and the energy and Middle East pictures have changed dramatically. Most important, America’s reliance on the region’s oil supplies has been greatly reduced by its own domestic energy production revolution, and influential Saudis have been revealed as not only staunch Cold War allies, but as major supporters and enablers of the the kind of Islamic terrorism that resulted in the September 11 attacks and that continues roiling the Middle East – and claiming American lives – today. As a result, even though the Saudis remain important holders of American debt and assets, and therefore remain as significant props for U.S. economic activity, their leverage over the United States has clearly diminished since the height of their petro-power. At the same time, other forms of American economic dependency have reached worrisome levels – notably for many advanced manufactures, including those used in military systems. And these dependencies, too, result from neglectful policies, not industrial realities. In this third decade of the post-Cold War era, with the subpar U.S. economy continuing to outperform most major competitors, it seems inconceivable that a future president would send his or her Treasury Secretary abroad to stave off the prospect of blackmail. But a few years before Simon actually left to meet with the Saudis, I strongly doubt that he or President Nixon could have imagined undertaking and ordering this mission, either. Two weeks ago, I wrote that if opponents of Donald Trump really wanted to stop him in his tracks, they’d support seriously addressing the legitimate economic grievances of his supporters. The firestorm ignited by the Republican presidential front-runner’s proposal temporarily to bar non-citizen Muslims from entering the United States signals that legitimate national and personal security grievances need to be dealt with, too. After all, that would be a constructive response. Instead, most of the anti-Trump forces, especially in the nation’s elite media and political classes, have doubled down on the invective. Egan also just as typically charged that “Trump has no solutions for the desperate angst of his followers.” That’s patently false. Trump’s position paper on China, closely resembles the specifics-laden approach taken by many critics of America’s China trade policies in Congress – especially in Democratic ranks. And although his call for mass deportation is surely unworkable (and likely to be replaced by a completely realistic attrition strategy), Trump’s immigration position paper is similarly detailed and entirely practicable – albeit anathema to the corporate Cheap Labor Lobby and the guilt-saturated elitist mass immigration crowd on the Left. But then Egan did something completely weird. He insisted that “Tearing up trade agreements is not going to happen.” But he himself offered no specifics as to why. After all, all treaties and similar agreements have “out” clauses. Abundant evidence shows that these deals and related policies have slowed growth (and therefore job creation) tremendously in this already miserable economic recovery. And opposition to the latest attempt to add to this destructive record – President Obama’s Trans-Pacific Partnership – keeps mounting. Even so dedicated an outsourcer toady as Senate Republican Leader Mitch McConnell has just urged that Congress not vote on the TPP until after the election. Which all raises the question: Is Egan ignorant enough to believe that a major course change for U.S. trade policy is still impossible? Or is he one of those boardroom liberals who’s trying to prevent one? Meanwhile, the futility of trying to marginalize Trump at all costs becomes clearer by the day. The latest evidence comes from the current round of opinion polls. As I’ve often written, they’re often full of problems and this last batch is especially all over the map. But two of them (from Rasmussen and Bloomberg) show that Trump’s Muslim ban – which I oppose – has attracted significant and partly bipartisan backing, and the Rasmussen survey shows it enjoys a plurality. Perhaps more revealing, NBC and The Wall Street Journal, which pegged backing for the ban at only 25 percent nationally, found in a pre-ban sounding that 54 percent of Americans believed that the United States admits too many immigrants from the Middle East – including more than a third of Democrats. And what does the public think of President Obama’s approach to terrorism and ISIS – which particularly in the former case the punditocracy seems to consider the gold standard? According to a new New York Times-CBS News survey, 57 percent disapprove. The bottom-line here appears pretty clear. Mainstream political and media elites are increasingly convinced that Trump has “crossed lines” that must never be crossed, and data keeps appearing that, thanks largely and understandably to their clueless insistence that standard approaches are working as well as possible, the lines themselves are moving dramatically. Making News: Coverage by Bloomberg, CNNMoney, IndustryWeek – & More! >Today, CNNMoney’s Heather Long quoted me on the headwinds still facing the domestic manufacturing sector. Her report so far has been re-posted by Madison, Wisconsin’s WISC-TV, and by the Hartford, Conn. Business Journal. >On November 11, Simon Constable’s Ozy.com post featured my views on why President Obama’s new Pacific Rim trade deal was bound to benefit Japan much more than the United States. >On November 9, Clare Goldsberry’s post for Plastics Today spotlighted my finding that domestic manufacturing was (to that point) stuck in a recession, along with other signs of industry weakness. >On November 6, IndustryWeek reported my RealityChek post on the jobs recession manufacturing is still suffering. And yesterday, this point was picked up on the Jewish business-oriented site Jewocity.com. >On November 4, Bloomberg’s Peter Coy covered my finding that September’s U.S. manufacturing and China goods trade deficits had hit new monthly records (the bad kind). Keep checking in with RealityChek for new reports on such media appearances!